Fingerlings Playset – Monkey Bar Playground + Liv the Baby Monkey in Stock! Hurry and get the Fingerlings Playset – Monkey Bar Playground + Liv the Baby Monkey (Blue with Pink Hair) today for only $24.99 from Amazon! Ships and sold by Amazon (not a 3rd party seller). Hurry!! This will go quickly! LIMIT 1! Right side up or upside down, this play set is the perfect place for your WowWee Fingerlings pets to monkey around! 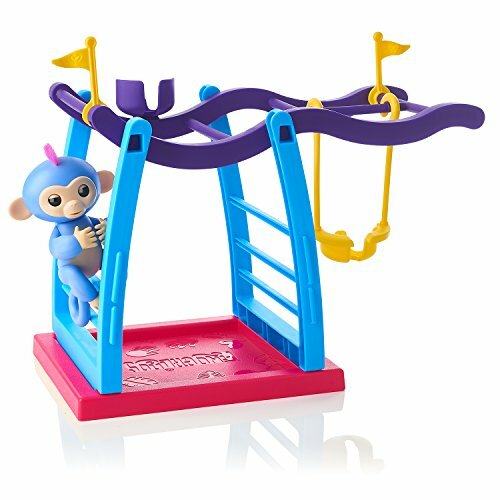 This monkey bar and swing play set includes Liv – a cute, exclusive, periwinkle blue Fingerlings Baby Monkey with pink hair. Like all Fingerlings Baby Monkeys, Liv loves to interact with you – responding to touch, sounds, and movement with cute monkey babble, blinking eyes, and head turns. When Liv is not holding onto your finger, she will love playing in her play set. You can hang her by her tail on the monkey bars, push her back and forth in the swing, or have her play “king-of-the-castle” from the seat at the top of the structure. The seat and swing feature specially designed cut-outs to fit a tail, so Liv and your other Fingerlings Baby Monkeys remain safely seated while you play! The brightly colored, durable playground features a yellow detachable swing and flags, purple monkey bars and seat, blue ladder structure, and a pink base, with plenty of room for the included Fingerlings Baby Monkey to play with your other little pets. Buy the Fingerlings Playset – Monkey Bar Playground + Liv the Baby Monkey (Blue with Pink Hair) from Amazon. Previous articleRARE Steak-Umm Coupon To Print and NEW Sale at Giant Eagle! Next articleIn-Stock!! Purple Fingerlings Glitter with Blanket – Interactive Baby Monkey!